Barnes, C. D. & Twidwell, D. (2019, April). Integrating resilience into law, policy, and science to better manage Nebraska grasslands. Poster session presented at the Spring Research Fair at the University of Nebraska, Lincoln, NE. Ludwig, A. K., Fill, C., & Twidwell, D. (2019, April). Developing abundance landscapes of the federally endangered American burying beetle to inform land managers in the Loess Canyons. Poster session presented at the Spring Research Fair at the University of Nebraska, Lincoln, NE. Kirsch, B., Basche, A., & Corman, J. (2019, April). Impact of agricultural land use and weather on water quality. Poster session presented at the Spring Research Fair at the University of Nebraska, Lincoln, NE. Barnes, C. D., & Twidwell, D. (2019, February). Navigating rigidity traps at the nexus of law, policy and science to foster resilient rangelands. Poster session presented at the 2019 Society for Range Management Conference, Minneapolis, MN. Ludwig, A. K., & Twidwell, D. (2019, February). Landscape changes, land management, and the endangered American burying beetle in Nebraska. Poster session presented at the 2019 Society for Range Management Conference, Minneapolis, MN. Barnes, C. D., & Twidwell, D. (2018, December). Overcoming stationarity: Legal challenges and opportunities for resilient grasslands. Poster session presented at the 2018 Nebraska Prescribed Fire Conference, Kearney, NE. Fowler, J., Drijber, R., & Awada, T. (2018, December). Eastern redcedar invasion and management in grasslands may have long-term implications for soil health and resilience. 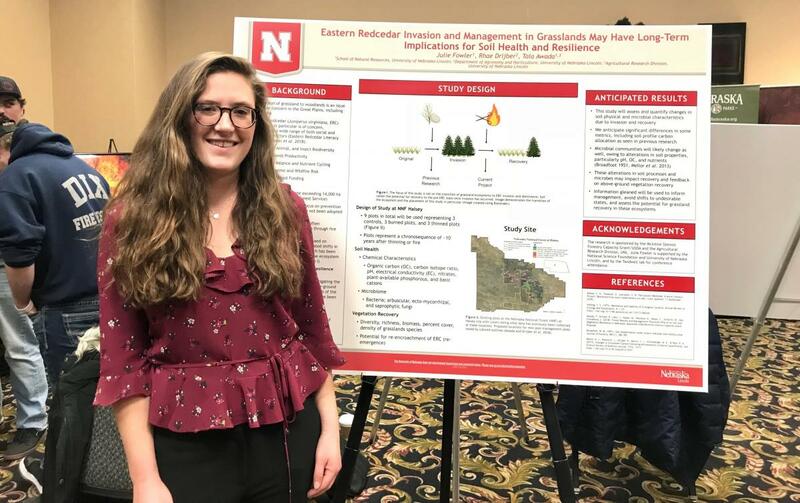 Poster session presented at the 2018 Nebraska Prescribed Fire Conference, Kearney, NE. Ludwig, A. K., & Twidwell, D. (2018, December). Implications of prescribed fire on the endangered American burying beetle in the Loess Canyons. Poster session presented at the 2018 Nebraska Prescribed Fire Conference, Kearney, NE. Khan, M., Munoz-Arriola, F & Clarke, J. (2018, October). Assessment of hydrologic regime shifts in the Mississippi River basin. 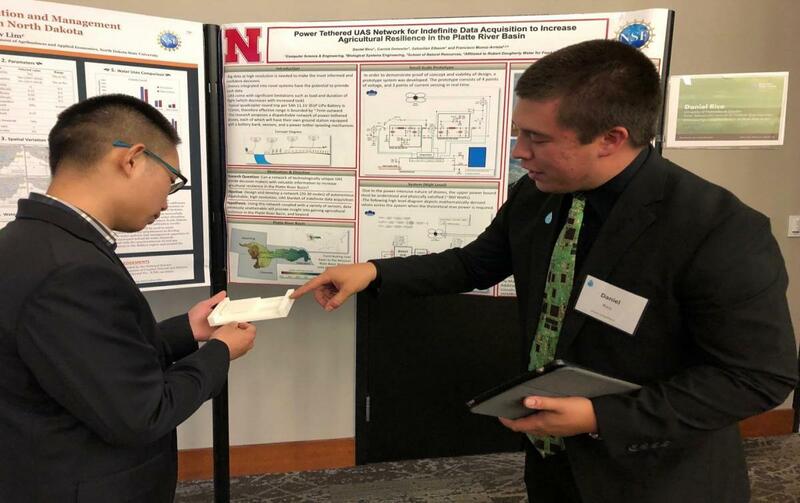 Poster session presented at the Water Resources of the U.S. Great Plains Region: Status and Future regional symposium of the National Institutes for Water Resources, Lincoln, NE. Rico, D. A., Detweiler, C., Elbaum, S., & Munoz-Arriola, F. (2018, October). Power-tethered UAS network for indefinite data acquisition to increase agricultural resilience in the Platte River Basin. Poster session presented at the Water Resources of the U.S. Great Plains Region: Status and Future regional symposium of the National Institutes for Water Resources, Lincoln, NE. Kirsch, B., Helmers, M., & Corman, J. (2018, October). Performance of nitrate-N removal in a small, field-scale wetland. Poster session presented at the Great Plains Limnology Conference at the University of Kansas, Lawrence, KS. Fill, C. T. (2018, October). Spatial and temporal patterns of bat activity in Nebraska agricultural landscapes. 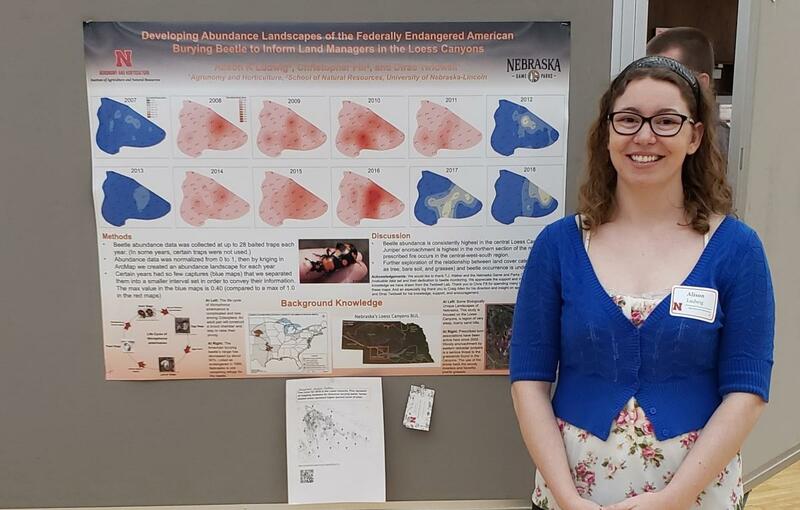 Presentation at the annual meeting of the Nebraska Cooperative Fish and Wildlife Research Unit, University of Nebraska, Lincoln, NE. Hogan, K. F. (2018, October). Seasonal pollinator resources in restored grasslands. Presentation at the annual meeting of the Nebraska Cooperative Fish and Wildlife Research Unit, University of Nebraska, Lincoln, NE. Barnes, C. D., Rico, D. A., and Munoz-Arriola, F. (2018, September). Technologic development and policy studies for resilient FEWES systems. Poster session presented at the National Science Foundation's 2018 NRT Annual Meeting, Washington, DC. Khan, M., Munoz-Arriola, F., & Clarke, J. (2018, September). Assessment of hydrologic regime shifts at basin scale over the contiguous United States. Poster session presented at the Midwest Big Data Hub Digital Agriculture Conference at the University of Nebraska, Lincoln, NE. Rico, D. A., Detweiler, C., Elbaum, S., & Munoz-Arriola, F. (2018, September). Power-tethered UAS network for indefinite data acquisition to increase agricultural resilience in the Platte River Basin. Poster session presented at the Midwest Big Data Hub Digital Agriculture Conference at the University of Nebraska, Lincoln, NE. Rico, D. A. (2018, September). Informal talks and demonstrations about the current state of his drone research to alumni of the Computer Science and Engineering Department at their 50th anniversary celebration at the University of Nebraska, Lincoln, NE. Barnes, C. D., & Twidwell, D. (2018, April). Legal challenges and opportunities to manage grasslands for resilience. Poster session presented at the Great Plains Grasslands Summit Conference in Denver, Colorado. 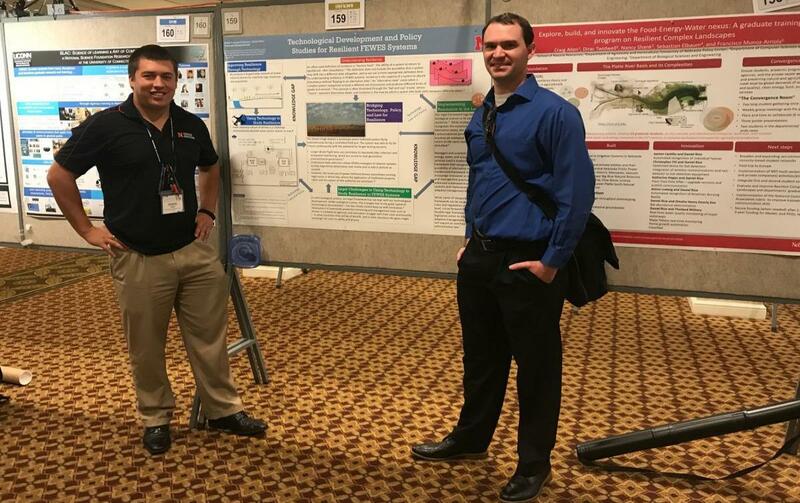 NRT students present their research at local, state and national conferences and meetings.